One of the reasons Walk With Me is such an amazing event is because it allows us to shine a spotlight on all the accomplishments of some of the children we serve. By shining a spotlight on these amazing children, we also in turn highlight all of the hard work and dedication of that child’s family, teachers, therapists and all of the other staff that work hard to maximize that child’s independence. One of those amazing children is Jack! We are so proud of his accomplishments and we can’t wait to see him shine at the Walk! 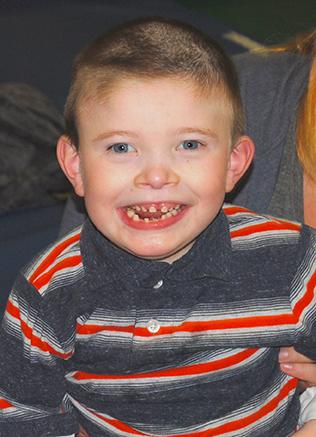 Jack loves to laugh and the sound of his giggle is so sweet that it seems to touch your heart! He is a happy five-year-old who happens to have cortical visual impairment and cerebral palsy. Thanks to mom’s instinct, Jack was diagnosed early and began receiving services when he was four-months-old. When he started center-based services, his family chose Easter Seals, because they felt hopeful here. Since Jack has been attending Easter Seals, he started standing, taking steps in a gate trainer, drinking out of a cup and much more. When he isn’t busy impressing the staff at Easter Seals, you may likely find him listening to music! His dad is a musician who sings to him all the time. He also has a thing for Taylor Swift. Jack also has a sweet tooth and will take every opportunity to indulge it. He also loves to cuddle, especially with his grandma who he spends a lot of time with. When you think about it, it’s easy to see why Jack is such a happy little boy! This entry was posted in child stories and tagged center-based services, cerebral palsy, Early Intervnetion, Easter Seals, Easter Seals of Southeastern Pennsylvania, gate trainer, visual impairment, Walk With Me on May 15, 2014 by Easterseals.